Solar Panels & Charging Kits. 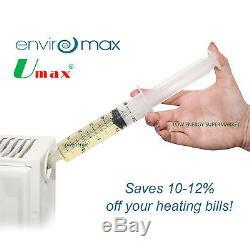 Umax Energy Saving Central Heating Additive, turn your thermostat down save 17%. Umax, the truly innovative way to reduce your energy bills! During testing, heating savings of up to 17% were achieved. Umax central heating additive is based on natural substances. Extensively tested and certified to give energy efficiency improvements. Granted patent in June 2013 for its unique energy saving properties. Suitable for all central heating systems, whether it be domestic housing or larger commercial systems. Umax also improves the performance of any corrosion inhibitors in your system and will keep your system cleaner, reducing pump and boiler maintenance. 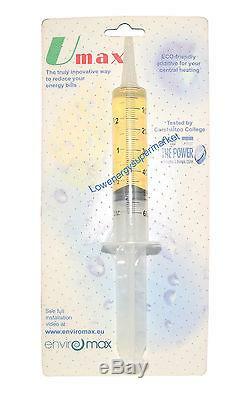 This concentrate form comes in an innovative injector pack so that it can be easily added to one of your radiators. Easy to install, simple, four-step DIY process shown the youtube video. The product will work over a range of concentrations. Only the leakiest of heating systems should lose the entire Umax additive over a year. In most systems the Umax will remain active in sufficient concentration for several years. The Umax additive is biodegradable but will not degrade within the heating system. There are no risks to your heating system and the product does exhibit some corrosion inhibiting properties. Umax is not a hazardous chemical although the concentrate is considered a mild skin irritant so gloves should be worn during application to the heating system. Umax will still work alongside any existing additives to your heating system with no detrimental effects on copper, aluminium, stainless steel or carbon steel. Umax works with all heating systems - oil, gas, LPG and biomass. Umax changes the way water boils, making the water in your radiators hotter without turning them up. As water in a central heating system passes over the heat exchanger in the boiler, a small percentage of that water will boil on the hot metal surfaces. During this boiling a layer of irregular bubbles forms which eventually join together and act as insulator between the gas firing and the water within the radiator circuit. Umax changes the way water boils so that only micro bubbles form which do not coalesce greatly increasing the heating efficiency and the transfer of heat from the boiler into the radiator circuit. To receive the full benefit of Umax®, your system should be cleaned and or flushed prior to installing. UMAX is also available as a 1 litre bottle of diluted product although we have found this 50ml viscous concentrate version makes the addition of UMAX to the central heating system much easier. One treatment of Umax 50ml viscous concentrate by syringe is sufficient to treat an average house of approx. 10 radiators or up to 100 litres of heating circulation water. Larger houses may require two syringes to ensure sufficient dilution into the radiator circuit water. To comply with all UK building regulations any electrical work should be carried out by a UK certified electrician. All electricity should be switched off prior to ANY electrical work being carried out. Low Energy Supermarket was founded in 2010, we offer various energy saving products which help to reduce the ever rising energy bills. We only offer quality products at a competitive price. Get all the Latest News, Updates and Special Offers about Our Store. Get in touch with us. We are trending on Social Media. Follow us and stay updated with our Latest Post, Blogs, Images. We are pleased to accept the following credit cards. The item "Umax Energy Saving Central Heating Additive, turn your thermostat down save 17%" is in sale since Wednesday, June 25, 2014. This item is in the category "Home, Furniture & DIY\Heating, Cooling & Air\Radiators". The seller is "lowenergysupermarket" and is located in Warrington ** NO COLLECTIONS SORRY **.